LASIK is the most performed refractive surgery procedure. Approximately 700,000 LASIK procedures are performed each year in the United States. 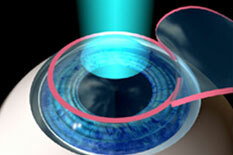 LASIK, stands for laser-assisted in situ keratomileusis. Commonly referred to as laser eye surgery, the procedure involves creating a ‘flap’ on the front of the eye (the cornea), removing or ‘ablating’ the underlying tissue to reshape it, then laying the flap back down over the area of the cornea that has just been reshaped. It is relatively painless and vision is almost instantly improved. Nearsightedness, farsightedness, and astigmatism can all be corrected within certain parameters. We perform LASIK using the latest Wavefront technology, which allows for the most accurate results when performing pre-operative measurements. The result is clearer vision without glasses for most patients. The first step to finding out if you’re a good candidate for LASIK is by making an appointment. Once we determine your prescription and perform a dilated ocular health exam, we can discuss your candidacy further. At Hertzog Eye Care, our physicians are experienced professionals at providing LASIK surgery utilizing the latest technology. Contact Hertzog Eye Care if you are looking for a a leading laser eye surgeon Long Beach to correct your vision.